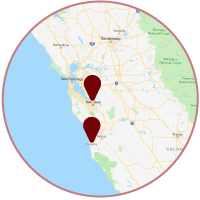 Aaron Overhead Doors provides a variety of garage door repair services in both the Monterey, CA and San Jose, CA areas. We offer prompt service and quality repair to get your garage door fixed quickly. A broken spring it’s pretty obvious. While in your garage with the door closed, you will be able to see a spring with a 3 to 5 inch break in it. You will also notice that when activating the opener, the door will not open. You might also hear a bang when it breaks. Garage door torsion springs hold a lot of torque so please do not attempt to touch them. Keep clear and call us. We can also help you get your car out of the garage in most cases. We are a certified Amarr & Liftmaster dealer. Garage door openers usually last 8+ years depending on the brand. We can service your current garage door opener or offer new ones. We can work on all garage door openers, however, in some cases the cost of repair can be close to the cost of a new garage door opener. Either way, we can diagnose your opener and give you options and prices so you can make an informed decision. We service and repair all types of garage doors, including but not limited to residential glass, wood, and steel garage doors. No matter if it is a garage door off track or a broken spring or opener, we can get there quickly and repair it correctly. Do you have a section in your garage that is broken or dented? We can replace that section only and save on replacing the entire garage door. This is an option on sectional garage doors. We can diagnose your door quickly and offer you options. If you garage door won’t close it’s most likely the safety eyes. This can be a quick fix or a difficult fix. In some cases the safety eyes need to be moved or replaced. Neither option is very expensive and typically a quick job. In San Jose, CA, call us at 408-684-6791; in Monterey, CA call 831-290-1765.